I may never go to the moon, but it’s nice to know that if I do my Speedmaster will still keep ticking. I like watches. I particularly like watches that have some history or character about them. Watches that are designed for a purpose, not just to look good. 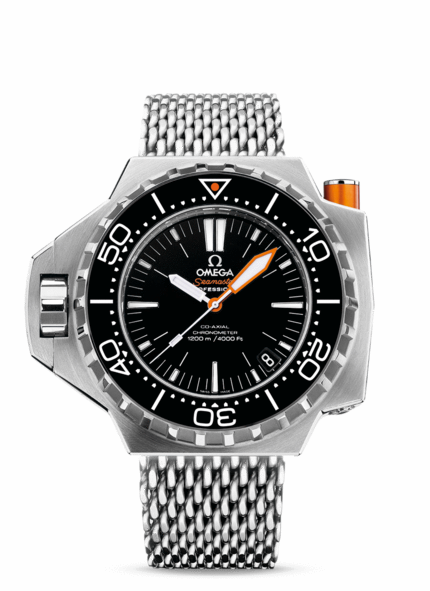 Omega have released a new version of their Seamaster PloProf. The standard Seamaster is a nice watch, good enough for James Bond, but the PloProf is like a Seamaster on steroids. The first PloProf (the name comes from plongeurs professionnels – French for “professional divers”) was first released in 1970 and it was rated to the man-crushing depth of 600M. It also looked like no other watch. The crown was on the other side and under a protective shield to allow freer wrist movement and to protect against any accidental changes at depth. At the 2 o’clock position is the orange bezel-release security pusher. You need to push this to move the bezel, again to prevent any accidental asphyxiation on the sea floor. The new PloProf has all these same features as the original but doubles the depth to a giant squid-dwelling 1200M. You can also get it with a “Sharkproof” bracelet. Nice to know that if you drop it in the bath, or get your arm bitten off by a shark it will still keep time.